The Chip Kelly Oregon spread offense is NOT zone reading on some plays? This offense is known for the infamous read option of a defensive lineman or linebacker as we fans work to determine who is getting zone read on a particular play. It seems that sometimes we are not reading or optioning anyone, yet the results on these plays are often quite productive. The old-school Inside Zone play is a staple of most football teams, and it appears that Chip pulled this old gem out of the playbook to help defeat Kansas State. 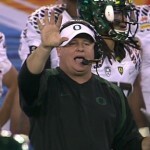 Let’s go back in time to understand what Coach Kelly is doing in the present! Most Oregon fans are accustomed to hearing about our option or “Read” attack. 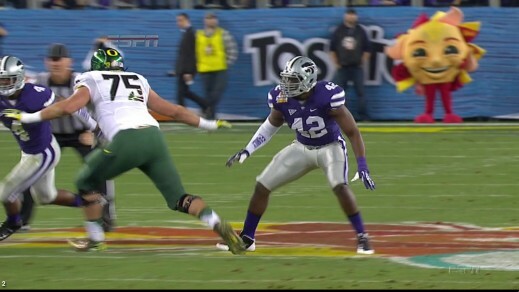 Oserve how QB Marcus Mariota is looking at the defensive end or “reading” him (dotted yellow arrow above). If the DE sits, or stands still, as you see above…then the QB cannot run through that potential gap, so he is hands off to the running back going the other direction where we have a favorable blocking match-up. Note how our right tackle, Jake Fisher, is NOT blocking the defensive end in front of him or ‘over” him, and instead moving inside to block the inside linebacker (red circle). The Wildcat DE #42 demonstrates “sitting” superbly in the play referred to above while Jake Fisher (#75) moves inside to block the LB. 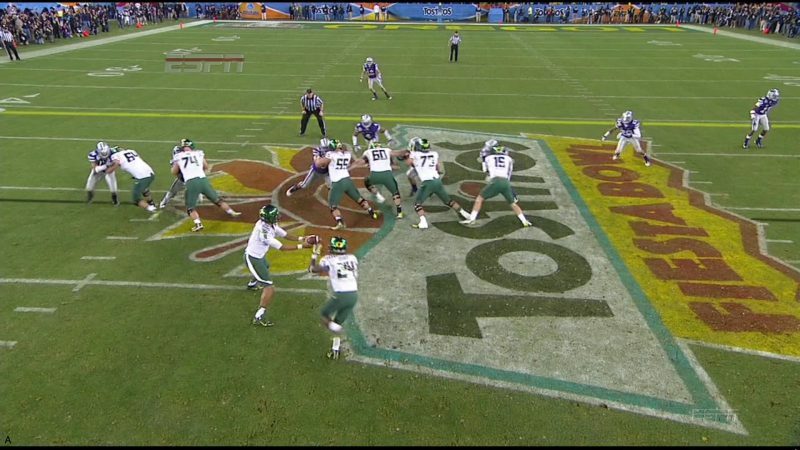 Here is a play we usually see when we’re burning out the clock at the end of games, but this time we saw it early in the Fiesta Bowl. The pure version, the Inside Zone play, is the original version of what we run as an Inside Zone Read now. 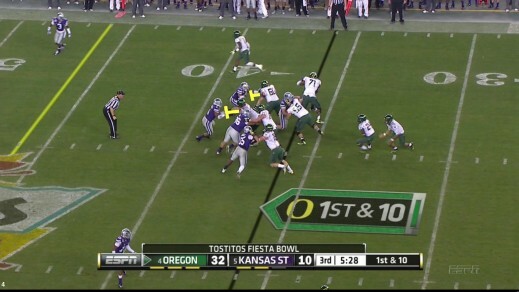 Kansas State was concerned about our bubble passes to the top of the screen, so they dedicated an extra defender (purple dotted line) to stop the damage that our WRs can do in the open field. This left the classic hat-on-hat blocking (above) that we love at Oregon, thus you see no defenders sitting or being unblocked on the defensive line. We are blocking everyone with the match-ups we have! Kansas State dares us to run right at them as they line up with only six in the box (red dotted box above), and we have six to block on the LOS when we add Colt Lyerla, our tight end, to the blocking scheme. We don’t have to leave anyone unblocked and “read” them to pick up a hat-on-hat blocking scheme. We already have it with the way they lined up! What you see above is the classic foundation play for thousands of football teams, the Inside Zone. The play is meant to go inside, right where Barner is headed. There was no reading or optioning by Marcus, just a straight hand-off. Kenjon is headed to the guard-tackle gap, but if he sees a better hole, he can charge toward it. Why is this play called the Inside Zone? Obviously the play is meant to go inside like an old “dive” play, but instead of straight ahead or “man” blocking, we use zone blocking principles. TE Colt Lyerla (far left) and then Tyler Johnstone engage their defenders, while Hroniss Grasu (#55) battles his man. At right tackle Everett Benyard (#71) handles his DE just fine. Where we see the yellow lines indicating blocks–those are by our guards Kyle Long, and Ryan Clanton #60 who have helped initially block the defenders in their “zone” with another offensive lineman, and then they go block the linebackers immediately, hence all six defenders in the box are accounted for and blocked. It is one of the most basic hard-running plays devised, and it is a beautiful sight to see. The beauty of the play is that while it is designed to go inside, the defense knows it’s coming inside as well and we can run around them! Barner gets eight yards on this Inside Zone as Kansas State stacked up their defenders in anticipation of the inside run while Kenjon bounced around the mass to the open field. The classic Inside Zone is one of Chip’s bread-and-butter plays that I should have included in the Tutorials a long time ago. You will see it often in our games, and is actually an important part of his game planning. Did you notice how difficult it was to run outside or run the bubble passes against the Wildcats? Again — they placed an extra defender, a safety most often, out there to stop our outside zone reads, our sweep reads, and bubble pass series. However, what happens when they guard the perimeter too much? 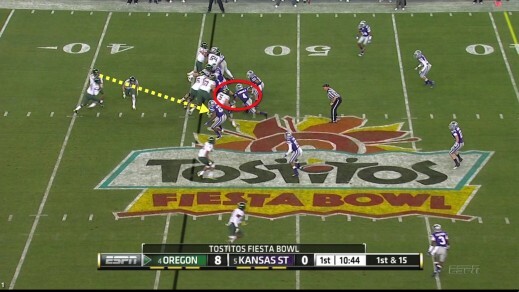 Chip then sees the favorable match-up in the box and runs the ball right at them, and often with this play we saw in the Fiesta Bowl, the Inside Zone!